AMD showed its hand first in this year's GPU arms race with Nvidia... by turning it into last year's arms race. 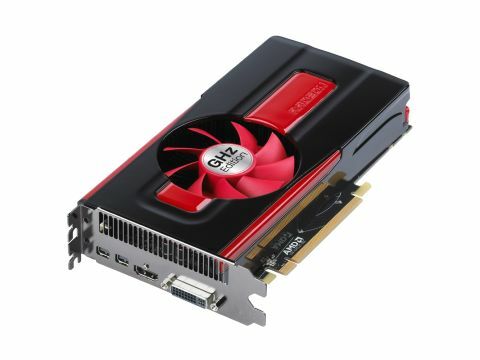 While Nvidia has kept shtum about its upcoming new 'Kepler' architecture and looks to do so until Spring, AMD stole the march and released the first of its new 7-series cards, the AMD HD 7970, a few days before Christmas 2011. That sure was odd timing, but it taught us a lot about AMD's new Southern Islands architecture, specifically the 'Tahiti' chip. It's fully PCIe 3.0-supported, uses a 28nm manufacturing process to pack more transistors onto a PCB than ever before, and apart from offering very quick DX11 game frame rates, it's a highly energy efficient beast. When your system drifts off into standby, the Tahiti card switches itself all but off too, minimising power draw. The HD 7970's whopping £440 price made all those neat features all but irrelevant to the gaming masses though, so we're putting our hopes on this HD 7770 to deliver the best bits of the new AMD architecture for a more palatable price. The 'Cape Verde' chip that this HD 7770 is built around makes full use of the new Graphics Core Next architecture like its big bro, with ZeroCore power efficiency in tow and a solid 1,000 MHz core clock. If it can offer a slice of the HD 7970's performance for this price, it's on to a winner.